The Smart Telephony Assistant was developed within the SerCHo Project to create an optimum user interface for communication services and interactive media applications in Ambient Assisted Environments. To overcome a situation in which provision of each such service is tied to a specific devices, and therefore usually tied to a specific location, the STA splits up the overall data stream of the communication service into four independent data channels: The Audio-in-channel, audio-out, video-in and video-out. Via the home server, the STA can distribute each of these four channels to any terminal device capable of rendering that specific stream. The user interface for an in-house video call may be assembled from various appliances – The home stereo for audio out, the TV for video streaming, telephone in hands-free mode for audio input for example. The terminal device for each channel can be chosen by the user according its technical capabilities, the specific situation of service utilization and personal preferences to aggregate an optimum overall interface. 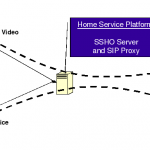 From the home server, where the STA is installed, the STA processes SIP-based communication services. A model representation of any SIP-enabled device connected to the server gives information about the specific input and output characteristics of the device. The STA adapts data transmission to these characteristics for maximum quality of service. Dynamic adaption is performed during service utilization for example if channel redistribution is determined by the user. Besides flexible, seamless channel distribution, the STA also provides a function clone channels which enables various configurations of in-house conference calls. Through the integration of localization context data in the SerCHo project, an additional follow me function for communication services is provided which again dynamically distributes active communication channels to those devices closest to the service user while the STA covers seamless transfer and terminal compatibility.